Folksinger Dar Williams does her part for a local cause next Friday, when she performs at the Bellows Falls Opera House in support of their farmer’s market. David Francey, a Canadian singer-songwriter who’s built a following through several area performances, opens the show. 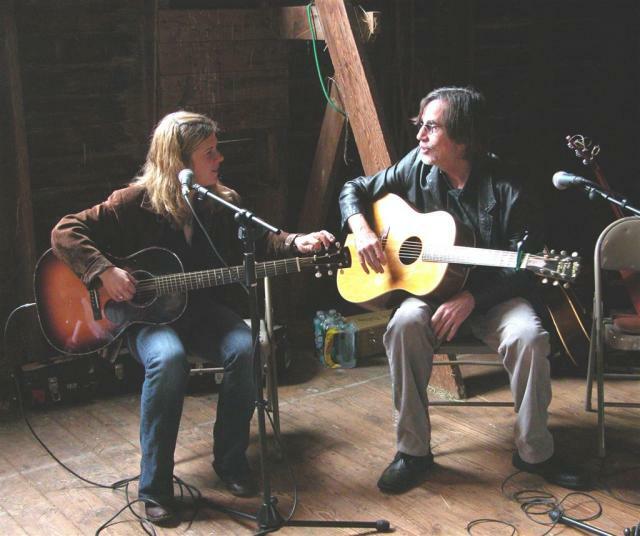 The Bellows Falls Farmers Market will host a reception in the lobby prior to the concert. The market, which officially opens May 18, provides a comfortable environment for fruit and vegetable growers from the surrounding counties to sell their wares. It features crafts, canned good, as well as some great local music. Upcoming performers include the Little Hope String Band, Josh Maiocc, Julie Waters, Patrick Fitzsimmons and Jesse Peters. Show promoter Ray Massucco pitched the benefit idea to Williams at her New Year’s Even show in Northampton. She readily agreed. “Dar has always been supportive of community-based agriculture,” says Charlie Hunter of Flying Under Radar, who is co-promoting the show with Massucco. It doesn’t hurt that Hunter managed Williams early in her career, and that the two have remained friends. But her commitment to activist causes runs deep in any case. Many of her songs reflect her political beliefs, from the anti-war sentiments in “Empire,” from her last album, to “Play the Greed,” perhaps the most eloquent ode to green capitalism ever written. It was part of the “Hempliations II” anthology a few years back. All the while, she’s donated her time to a myriad of interests and issues. In 2005, she sponsored a group of Dartmouth students who traveled the country promoting alternative energy in a french fry oil-powered vehicle dubbed “The Big Green Bus.” While on tour in support of her most recent album, “My Better Self,” Dar’s “Echoes Initiative” would choose a local charity in each city she played. At her Burlington, Vermont show, fans donating to the Chittenden Food Bank received passes to a post-show meeting with the songwriter. Last month, she peformed at an anti-war teach-in, and in support of an Ossinning, New York education foundation. Tomorrow, she plays a private concert in conjunction with an event at Harvard’s “God-Free Chaplaincy” honoring the writer Salman Rushdie, Nobel laureate Amartya Sen and scientiest E.O. Wilson, among others. “I expect I’ll receive a very nice tote bag,” quips Williams, never at a loss for levity. The Farmer’s market show was, Dar says, a natural choice for her. “I finally realized that local food groups and community gardens provide an approachable microcosm of all the global issues I support,” Williams said in a statement on her web site.